The EU Water Framework Directive came into force on 22 December 2000. It was introduced in response to a consensus across Europe that water policy was fragmented. This single piece of framework legislation expands the scope of water protection to all bodies of water, surface water and groundwater, with the aim of achieving ‘good status’ by 2015. Assessment and management of water bodies has been carried out on a River Basin District basis. Water bodies include lakes, reaches of rivers and groundwater bodies. 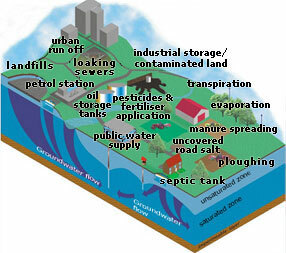 Groundwater bodies are defined as distinct volumes of groundwater within an aquifer or aquifers. The definition of aquifer used in the Directive means that most of the rocks in the UK that were previously classified as non-aquifer material are now considered to be aquifers. Little of the UK is not underlain by a groundwater body. to ensure compliance with the relevant standards and objectives for ‘Protected Areas’ within 15 years of Directive implementation (includes groundwater bodies from which abstraction for human consumption exceeds 10 m3/d or serves greater than 50 persons). Less stringent objectives for specific bodies of water may be set where these are so affected by human activity or their natural condition is such that it would be unfeasible or disproportionately expensive to reach good status. The 15-year target date can be extended where there are reasonable grounds. Groundwater status consists of both quantitative (the amount of groundwater) and chemical (the quality of groundwater) components. Groundwater levels have been used as one of the measures of quantitative status, using a weight of evidence approach. To achieve good groundwater quantitative status, the available groundwater resource (i.e. the long-term average rate of overall groundwater recharge to the body less the long term annual rate of flow required to achieve the ecological quality objectives for associated surface waters) is not exceeded by the long-term annual average rate of abstraction. Groundwater abstraction must not also cause failure of good ecological status in dependent surface water bodies, significant damage of dependent wetlands (groundwater dependent terrestrial ecosystems) or saline or other intrusions. would not result in failure to achieve the environmental objectives in associated surface waters or terrestrial ecosystems. economic analysis of water use. if not already set by Commission, Member States to establish criteria for assessing good groundwater chemical status and identifying trends in pollutants. Commission to put in place emission controls for point sources and environmental quality standards for substances on first list of priority substances. establishment of River Basin Management Plans including a Programme of Measures designed to enable objectives to be met. appropriate water pricing policies put in place. Achievement of ‘good status’ in all water bodies except for those cases where extended deadlines or other objectives have been set in order to ensure measures are technically feasible and no disproportionately costly. provision of public information and consultation. Explanations of these aspects can be found at sites listed on the links page. Certain existing legislation will be repealed in due course as a result of the Water Framework Directive. The Groundwater Directive (80/68/EEC), protecting groundwater from pollution by certain dangerous substances, will be repealed in 2013. The Nitrates Directive (91/676/EEC) will remain in force. Groundwater - all water which is below the surface of the ground in the saturated zone and in direct contact with the ground or subsoil. Aquifer - a subsurface layer or layers of rock or other geological strata of sufficient porosity and permeability to allow either a significant flow of groundwater or the abstraction of significant quantities of groundwater. Body of groundwater - a distinct volume of groundwater within an aquifer or aquifers.